Our weekly commentaries and updates will be free until April. Effective April 2019, a subscription will be required in order to receive them. Of course, clients of Fundamental Analytics and BlackSummit Financial Group will continue receiving our weekly content for free. Natural Gas prices gapped up on Monday due to cold weather and cold weather forecasts. The NYMEX February Natural Gas contract opened up at $3.33 mmbtu, up 23 cents from Friday’s close. The contract ended the trading day at $3.59, up a significant 49 cents from Friday’s close (Chart 1). Natural Gas production remains strong but storage, as reported by the EIA for January 4, 2019, is at a record low of 2,614 bcf for this time of the year (Chart 2). 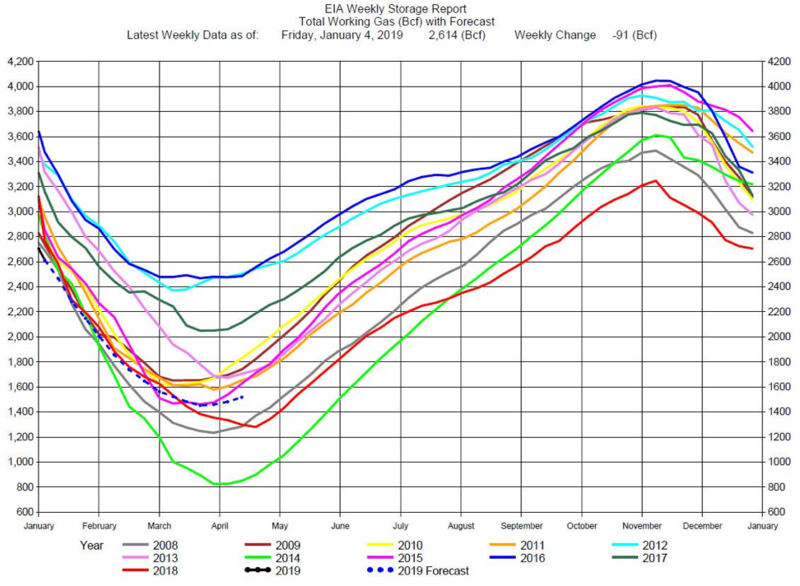 The computer model forecast of storage by the end of the winter season has storage at about 1,400 bcf for a normal cold winter. Should the current seasonally colder winter weather continue for extended periods, storage would end up closer to 1,200 bcf. Low storage will cause prices to rise. 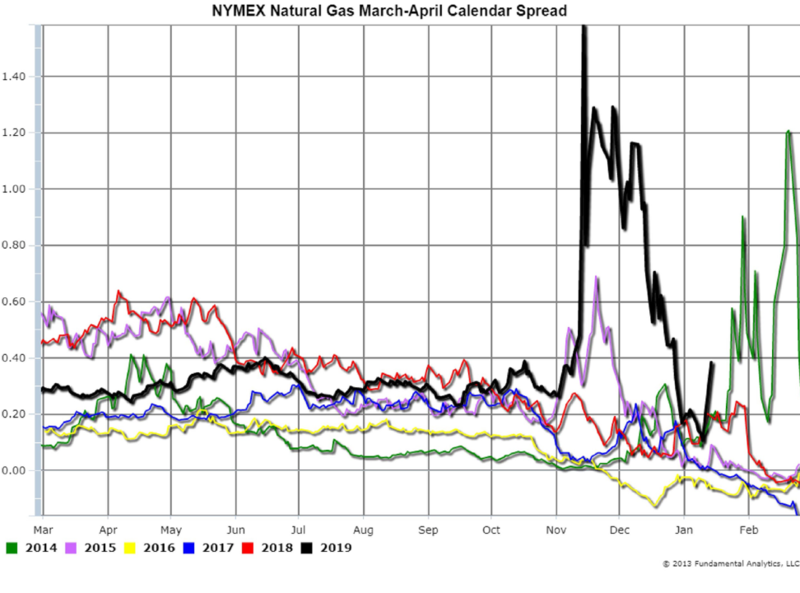 The March-April Natural Gas calendar spread (Chart 3) is a measure of traders’ expectation of end of winter storage levels. Expectation of low storage widens the spread. On Monday, the spread increased from 11 cents to 38 cents (Chart 3, black line). In 2014, shortage ended at a record low of 600 bcf (Chart 2, green line) and the 2014 March-April Natural Gas calendar spread (Chart 3, green line) spiked to 90 cents and then to $1.20. The current March-April Natural Gas calendar spread (Chart 3, black line) has been as high as $1.58 in mid-November. It is possible that the spread could again reach that level.